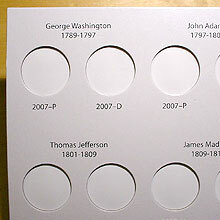 From 2007 to 2011, George Washington to Ulysses S. Grant. Both D and P one coin each per president. *Image on left is the detailed picture of top left corner.